Phil Eich makes a case against traditional physical education, in which sports form the foundation but provide little motivation toward lifelong fitness. The CrossFit Kids curriculum is effective because it creates a physical learning environment that builds on the idea that all children have differing abilities and need to be challenged at their individual point of development in order for effective learning to take place. This differentiated instruction allows a child to continually and efficiently progress, minimizing the risk of frustration or stagnation. Every skill, every movement, every workout and every game can be scaled to a child’s ability (made easier or harder) so he or she is challenged by something difficult but not discouraged by something impossible. This not only allows for efficient and effective teaching and learning but also increases students’ desire to participate and challenge themselves. CrossFit Kids uses the natural process of motor development to increase learning effectiveness and efficiency. Instead of confining a child’s development with rules and movement limitations of sports while running the risk of contributing to the detrimental effects of overspecialization, CrossFit Kids uses a child’s natural propensity for constantly varied movement by using constantly varied movement. This curriculum provides for the direct teaching and assessment of necessary physical skills, and one is able to monitor progress by providing quantifiable data: movement improves, workout times decrease, number of reps increase, new movements are able to be performed. Where improvement in the traditional physical-education classroom is largely subjective, CrossFit lays the groundwork for success, achieves success and is able to prove success is happening. Children are able to perform more advanced movements more times and faster. To a child, these successes are more than just a good grade, a pat on the back or a participation trophy; they are tangible evidence of accomplishment. Kids, like adults, want to do things well. CrossFit Kids gives children the best chance to be able to do things well because it equips them with foundational physical tools that can be applied to any future physical endeavor. It provides a pedagogically sound and effective physical-education curriculum that is fun and rigorous and provides lifelong benefits to children. Noble and Empower charter schools find CrossFit fits their mandate to pursue excellence in education. Chicago student wins charter-school “education lottery” and earns full college scholarship. Daniel Rodriguez won the lottery when he was 13. Children in a school setting need to learn lifelong fitness, not meet a standard set number for physical education hours. Children in a school setting need to learn how to set and work to reach goals, not pass a standardized test. Children in a school setting need variation instead of a preset program based on daily schedules. Children need peer support, personal interaction, and encouragement instead of an imaginary gate slamming behind all of the masses as they are pushed through the system like livestock while someone shouts, "Next!" So cool to see this published! 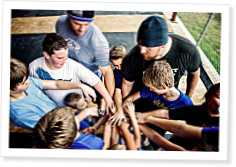 Part of the work of the CrossFit Kids Educators Committee is to help schools and educational administration begin and sustain implementation of CFK. For questions or more information, contact me at eichpd@gmail.com. Congrats Phil. Seeing your work published is fulfilling! Kids need enthusiasm! Crossfit Kids is certainly an excellent tool to spread the joy of moving while giving them competence to do so properly. I absolutely agree, Matt. Increasing physical competency while having fun is everything needed in good physical education, and it has been a blessing to see how using CFK to reclaim natural functioning has affected my kids. Great Article Philip. I have had this discussion for years. There is no athletic progression for kids in PE classes. I remember doing gymnastics for a couple weeks every year because the equipment was purchased 30 years before and they had to use it. Now that would have been great if we started the progressions in the first grade but it was painful to start at 13 years old with no background in gymnastic movements. If you were not interested in traditional sport or did not have natural athleticism then you had no fun in those classes. CrossFit Kids continues to make headway, and excellent work like this is an essential part of it. Thanks, Phil. As a PE teacher and L1 trainer I've found great success in the CrossFit Kids curriculum and programming for our elementary classes. This past Friday we culminate the school year with a mile run at a nearby track. After an entire year of WODs every single child in grades 1-6 were able to set a PR! The mental fortitude from daily classes combined with the competitiveness and community we have created through our programming made this day amazing! One example was a child who finished first got a quick drink, then asked if he could do the last lap with a friend who was struggling to finish. While he and a few others did this, the rest of the class formed a huge archway with arms for the child to run through to the finish line! One thing I hope the curriculum and CrossFit could do in the future is create a series of WODs as benchmark workouts for kids, not similar to, but a way of monitoring and tracking progress quarterly and yearly like the past Pres fitness testing. If this is something thatCrossFit Kids is thinking about and you'd like an elementary school to be a pilot for I'm all in. Marco - we are on the same page. A curriculum lacking progression is eay to implement - throw some dodgeballs on the floor or se basketballs on the court, and the kids will amuse themselves the entire class period. Kids are moving - this is good - and they are having fun - also great - but it fails to produce real results and becomes unethical pedagogy. That is not to say every PE program based on sports and games has no benefit to children and are terrible and run by lazy teachers. But I think CFK causes us to see that increasing the proficiency of foundational movements in children is a much greater gift than only increasing proficiency at sports. There was a bit of twitter backlash after this article was published (I think that means I'm legit now) saying that we should "just let kids play dodgeball". We still play dodgeball, but it's better (the kids get tagged, run to me, and pay a "burpee/squat/push-up/etc. tax" to get back in.) In CFK, we can do everything the traditional model can do, but better. I also will say that I had a 5th grader ask me if he could take one of our jump ropes home over spring break to work on his double-unders, and he practiced the entire break. His dad had to pull him out of the garage. This last week, one of my sixth graders, who struggles athletically and with her weight, got a 3rd place in our track meet - her first ribbon ever. Today a dad talked to me about how his daughter, who is in my class, was teaching her younger sister how to do handstands. These kids are willfully practicing things they're learning outside the classroom because there is progression towards a challenge, produces results while bein incredibly fun. Justin - email me (address above) and I will hook you up. This is awesome. Are you guys doing the spartan race programming for kids as well? We created a mini challenge course for our middle school field day. How do I plug into the kids curriculum? I am a middle school/high school PE/Health teacher as well. Check out crossitkids.com - they have things to help get the ball rolling. E-mail me and I can connect you with the Educators Committee, as well as send you things I have. I love this article. I am an elementary school physical education teacher, and I have an L1 cert. I've just recently come across the resources for CF kids, and I've been been really intrigued with the idea of trying to implement CF Kids into my curriculum. My biggest concern is that I have pretty large class sizes. I have 2 classes at a time, totaling about 60-65 kids. Does anyone have any experience implementing CF Kids with this many kids at a time? I would love any/all advice. Thanks. This is awesome to see! Crushes me to see PE today, the same as it was prob 20-40 years ago. Waiting on lines, team sports only.... etc. We need open minded Teachers AND we need to bring CrossFit Kids to gete exposure with undergrad Health & PE students. On the flip side, if the schools won't do it, then WE will do it in our gyms. I have also implemented the CF Kids curriculum into my PE classes with great success! I have been able to develop some strategies for organizing larger class sizes with limited equipment (a common scenario for many PE teachers I'm sure). I agree with Justin that a few recommended benchmark WODs would be a great tool to aide in assessment. Also movement specific rubrics (air squat, shoulder press, etc.) would be worthwhile too. Phil, I would be happy to help/contribute to the Crossfit Educator Committe if needed! Where can I get your email. I have some questions about starting up/proposal to administrators etc.. I am a PE teacher in WNY in a high school- I'm wanting to know where I can begin to look to find a grant to get equipment into my school. Our department recently started talking about this and after doing crossfit for about a year myself, I could definitely see out program benefit from this! Sunnie, We are in a rural school in Idaho and found that the United Dairymen of Idaho, in conjunction with the Play 60, have money available. Some of our students use this process as their senior project and it has helped our school to get some more equipment for bigger classes.